French police seized 104kg of cannabis and 984g of pure heroin suspected of coming from Albania. An Albanian citizen has been arrested, while there is suspicion that it is a structured drug trafficking organization. Drugs were seized in an apartment at "42 Avenue Berthelot" in the seventh district in Lyon where four months ago French investigators found that this site served as a logistical trap for Albanian drug traffickers. In late May, 10,000 euros suspected of being exploited by heroin trafficking were discovered after the arrest of a key asylum seeker. The latter was sentenced to three years' imprisonment. As French media "Le Progress" reports, the traffickers imagining that the police would not search at the same address twice, continued the activity. But the apartment was this week the scene of a record confiscation for local police, with a herbal cannabis stock and heroin with a market value of one million euros. 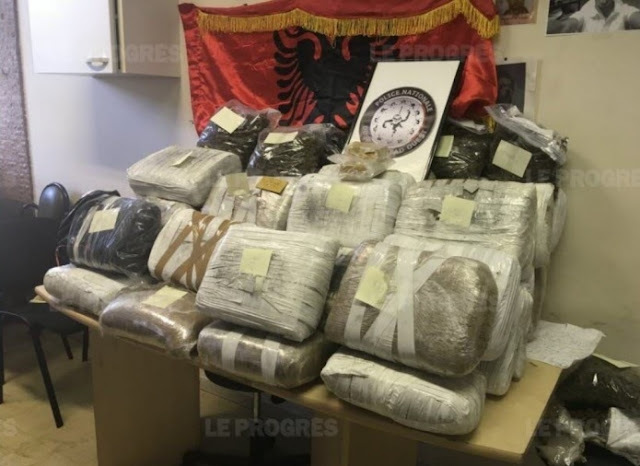 According to "Le Progres", police received information that an apartment in the seventh district was used as a depot under the supervision of an Albanian citizen. Investigations led to an address they knew well after being used by traffickers earlier. On Monday, during an oversight, the police saw a person leaving the apartment. They used his absence to bring in a dog specialized in sniffing narcotics, who stood in front of the door of the apartment. Investigators waited for the suspect to return home and in cooperation with the Prosecutor's Office opened the door of the apartment. After realizing that police officers were introduced into his apartment, the trafficker tried to leave from the balcony, then went on the roof. But he was arrested shortly thereafter. In the apartment, police found 104 kg of cannabis and 984g of pure heroin. The cannabis is suspected of coming from Albania. During the ban of the Albanian, which lasted 96 hours, he did not provide any information about his associates. The Albanian, whose identity was not disclosed, appeared this Friday at the prosecutor's office. Although no formal link has been established between him and the disbanded network in May, the use of the same apartment and Albanian citizenship raises suspicions that the detainee has links to a large criminal organization.